Don’t let a dodgy ladder shatter your life! 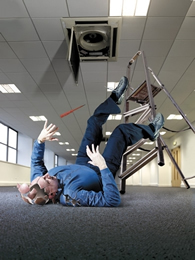 Falls from height continue to be one of the main cause of fatalities at work. In 2008/09 there were 35 fatalities to workers and 4654 employees who suffered major injury. Over two thirds of these major injuries are the result of a fall from a ladder. HSS Hire, Speedy, HARSCO (formerly SGB Hire), Ladderstore.com, Ladder Association, ABRU, A-Plant, Browns Ladders and Ceilings, Clow Group, Engex (in association with CEF), Globe Ladders, Ladder & Fencing Industries, TB Davies, Slingsby, Youngman Group, Zarges UK and new partners, Travis Perkins, Attic Access and Engex. The concept behind Ladder Exchange is very simple; where a user has a ladder which is broken, damaged or bent then they can bring it along to any one of our partner outlets and exchange it for a new one at a discounted price. If it is right to use a ladder then use the right ladder and use it safely. For more information about ladder exchange please visit the HSE falls website.